The subject of more songs and pearls of folk wisdom than other agricultural implements in those cultures where it was known, the scythe has often functioned as more than a simple tool with which to cut grass. To its most dedicated users it was a partner in a dance reaching, at times, beyond the mere practicality of the task into the realm of deep sensual and even metaphysical experience.. In a letter to us, Mary Majka, the well-known naturalist, now 78, who as a teenager spent considerable time working for an Alpine dairy farmer, put it this way: “…I knew exactly what you were talking about and was instantly transported to the days when I was using a scythe in Austria. At that time I didn’t understand meditation or t’ai chi, but I was enveloped in some kind of bliss which still comes back with old recollections.”. To experience the “bliss” which Mary refers to, the skill of using this fine tool needs to be acquired to a degree beyond the level of a casual user. “Die Sense muss tanzen” (The scythe must dance) is how Lambert Schoiswohl (a retired scythesmith from Rossleithen, Austria, who at 72 still mowed some extremely steep slopes) expressed it to me. How fitting!. Unfortunately the cult of the machine, as it progressively convinced ever more people to join its ranks, has, to an alarming degree, obliterated the patterns to many old dances. The little steps that matter so much, such as the details of shaping the blade’s edge or the intricacies of adjustments, are often lost first. In many areas where the scythe is still used today, some blades no longer travel the path of least resistance, are not dancing their best…. Do we want, and if so, are we still able to salvage the remains? Had some master of old written a comprehensive manual our task of re-learning the dance would now be easier. Evidently, real mowers were not prone to write handbooks on a well-known skill. As with many others, it was taught simply by doing. Grith Lerche, chief editor of the periodical Tools and Tillage in Denmark, wrote to me: “I’m afraid that not many who have recorded about mowing or harvesting have performed it themselves…”. For me, it has been a shocking realization to find that so little detailed knowledge has been preserved in writing about a tool of such historical significance. The authors of the in-depth scholarly works which document the evolution of scythe making as a trade and later as an industry did not take it upon themselves to record the ways in which the creations of the smiths were used.. In 1981 David Tresemer, a Harvard graduate-turned-homesteader fascinated with hand tools’ applicable to country living, wrote The Scythe Book. Though its inspirational content is praiseworthy, the guidelines on how to sharpen the blade as well as adjust and use the tool are, in my opinion, inadequate. To its author, however, I feel indebted: his work indirectly played a role in inspiring me to take the search beyond the level of purely personal interests..
Over the years I have written what seems like a thousand pages of letters to various Old World homes of the scythe, naively hoping that some distilled instructional wisdom (not a modern how-to version, but one with all the little steps included) could be found if one looked hard enough. Though I have not given up all hope, the opinion of many qualified people in English- and German-speaking countries (as well as a few others) implies that such a book probably does not exist..
During several trips to Europe, the sole mission of which has been to further my scythe-related education, I have met old mowers of some repute in their respective countries. As with other traditions of a culturally diverse continent, many regions of even one country had quite distinct and often rather rigid ways in which the scythe was used. The individuals who dared to break these rules in the past were few.. Admittedly, there are many ways in which grass can be cut with a scythe. However, I’m now convinced that some are considerably easier and more efficient than others. Having come to the conclusion that, from the perspective of ergonomy, the traditional one-grip snath of my Slovak forefathers was inferior to most Alpine designs, I felt free to break taboos if necessary, to find an alternative that would work “best”. Subsequently, a large portion of my efforts have been directed toward discovering what degree of harmony can be reached between the human body, the scythe and the task of mowing. In my present view, this is the “ace card” still unplayed ~ the potential not quite realized or fully developed. .
For the scythe to survive man’s obsessive quest for more “efficiency”, it either needs to evolve to a level clearly competitive with the mechanical alternatives, or it must be appreciated on its own special merit because it offers an unusual experience beyond purely pragmatic considerations.. It has always been primarily a working tool and under certain conditions will still outperform many of its substitutes. Yet most modern societies scoff at sweat, unless it comes as a by-product of sports or health-oriented exercises.. So, what can take the task of hand mowing from the sphere of work to that of pleasure and therapy?. Having been privileged to choose the lifestyle of a small farmer, I likewise never “made” our children use the scythe. I taught them how to do so,in turn, as they showed interest of their own. Should I detect any displeasure on their part I would be the first to suggest they find something else to do. Our daughter, Ashley, picked up the technique very quickly when she was six, though mowed only occasionally that first season and through most of the next. 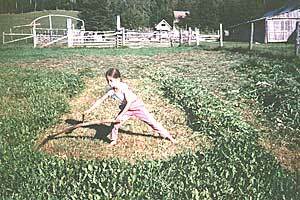 But two years later, as I watched her cutting an eight-foot-wide swath, I clearly knew she was having fun. She wasn’t toiling or even sweating. Her movement conjured up the image, rather, of a dancing dragon snaking its way through the grass, the growing windrow being the fringe benefit of her play… She could not do this with just any scythe, nor perhaps with most of them, even if they were cut down to match her size. Despite the many hurdles, I am convinced that it is possible to put a similar tool into the hands of many other mowers, and particularly those who agree that people, as well as the Earth, need healing, who believe that work and play can be one and the same, and who feel that hope must not be abandoned. It will take the cooperative work of many individuals ~ teachers who are willing to go the extra mile to share their passion for hand mowing, as well as dealers dedicated to excellence of service. If those who sell the scythe and its accessories were also accomplished mowers, so much the better. Such qualifications are certainly expected of the retailers of many “above average line” items (musical instruments, fishing and hunting gear, bicycles, etc.) In the realm of scythe selling there is plenty of catching up to do…. Further assessing the reality at hand, it must be admitted that the quality of the blades had reached a zenith of perfection decades ago, and has been on a gradual downslide since. It is also unlikely that we will surpass the sharpening skill of the mowers of the past. However, the snath design and the mowing movement itself can both be refined, and much of my time in field trials has been focused here. Initially I experimented in the scattered way of a lost apprentice, trying out all accessories I managed to obtain..
At some point I began a gradual deviation from the norm. First, during mowing, I stretched and shifted my body weight more to the sides with each stroke. This was not done in order to break records in swath width, but rather, I think, a spontaneous decision by my body. Many years earlier, while practicing T’ai chi, I came to appreciate the benefits of slow and deep breathing. Now, unless I breathed faster than felt most “comfortable”, a six- or seven-foot stroke did not allow for the breaths to be synchronized with the back and forth movement,whereas one of nine feet did. As an added benefit, because my legs provided much of the energy, it was also a way of compensating for old injuries in my right shoulder and wrist..
At the time I did not realize just how unconventional that was. However, such a movement distributes the demands on the body more equally and enables weaker individuals to use the scythe with relative ease. 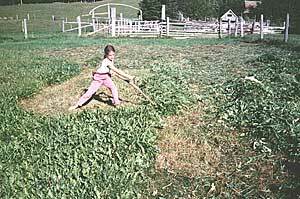 (This is how an eight-year-old girl, weighing less than 50 pounds, – using, of course, a sharp blade and an ergonomic snath – can mow in the manner shown in the photo.) . As my head tried to catch up to that body-initiated process, the considering of snath designs followed. I started making my own out of variously curved saplings and tree branches. Arriving at the basic body-size-specific dimensions was not all that difficult; matching the snath to a specific blade proved much more so. . It took me a while to start noticing all the small technical differences between the various blade models. These, I eventually came to understand, affect the harmony of the tool considerably. Thus a snath may work well with one blade, yet feel strangely awkward with another – even if the two blade models look darn similar to the inexperienced eye. Sometimes a slight difference in the angle of the grips can correct – or spoil – the equation of balance. . The relationship of the weight of the blade and the weight of the snath is another issue of pertinence. The material comprising the snath body can be distributed better than is the case with all commercially made models, in some instances, far better! I made more odd-looking snaths and was rewarded with some harmonized units which were a joy to use and helped my dancing in the meadow considerably.. Eventually, definite principles of scythe-related ergonomy began emerging… However, I have neither exhausted all the fine-tuning possibilities, nor, quite likely, rediscovered many of those little steps..